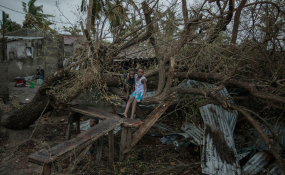 More than a thousand people are feared to have died in a cyclone that smashed into Mozambique, while scores were killed and more than 200 are missing in neighboring Zimbabwe and Malawi. Maputo — Flooding in the central Mozambican province of Zambezia has taken 444 lives, according to the provincial governor, Abdul Razak, cited in a Wednesday press release from the country's parliament, the Assembly of the Republic. On Tuesday, President Filipe Nyusi had announced a confirmed death toll from Cyclone Idai and the associated flooding of 202. But his figure referred mostly to Sofala and Manica provinces. Razak's announcement more than triples the death toll. The disaster began earlier in Zambezia than in other provinces. Torrential rains were lashing Zambezia, well before Cyclone Idai formed in the Mozambique Channel and struck at the Sofala coast. Speaking in the provincial capital, Quelimane, to a group of parliamentary deputies, headed by the rapporteur of the Assembly's Social Affairs Commission, Leopoldo Ernesto, Razak said that almost 90,000 people in the province had been affected by the disaster. The storms had destroyed 7,173 houses and damaged a further 10,740. Agriculture in Zambezia has been severely affected, he said, with 12,282 farms and 15,976 plant nurseries inundated, affecting 8,157 farmers. Schools have also suffered heavily, with almost 50,000 classrooms affected. The worst hit districts are Chinde, Derre, Inhassunge, Morrumbala, Mopeia and Luabo, in the Zambezi valley, where most of the roads are now impassable. According to the release, Ernesto, who is a member of the parliamentary group of the main opposition party, Renamo, said "we are pleased at the readiness of the authorities to support the people affected, and we note that, in some of the accommodation centres we visited some people are already rebuilding their houses. This is encouraging and shows the will to overcome this disastrous situation". Ernesto urged the provincial government to continue raising the awareness of local residents of the need to build their homes in safe areas, and to use resilient materials. They should live on high ground, and reserve the low lying areas for farming and not for building homes. He added that the authorities and organisations involved in relief work should prioritise the resettlement of victims in safe areas and not allow them to return to areas at risk of flooding. The deputies were mandated to visit Zambezia by the Assembly's governing board, its Standing Commission. Over a four day period, they visited Maganja da Costa, Mocuba, Namacurra and Nicoadala districts, where they spoke with flood victims in accommodation centres, and visited infrastructures damaged by the floods.